With reference to one production that you have seen, explain how two performers used their vocal and physical skills to affect the audience. 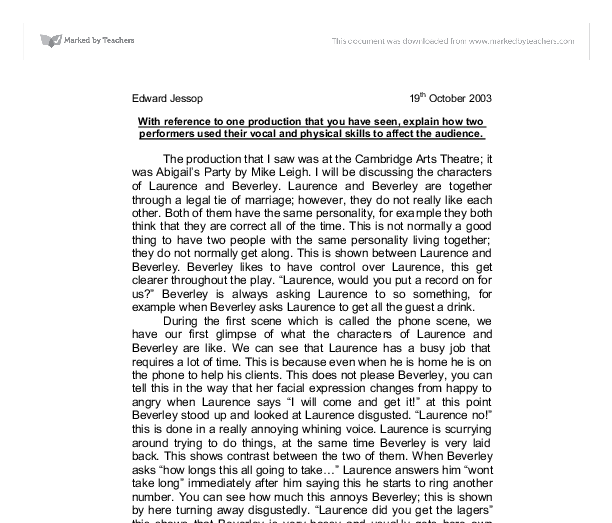 Edward Jessop 19th October 2003 With reference to one production that you have seen, explain how two performers used their vocal and physical skills to affect the audience. The production that I saw was at the Cambridge Arts Theatre; it was Abigail's Party by Mike Leigh. I will be discussing the characters of Laurence and Beverley. Laurence and Beverley are together through a legal tie of marriage; however, they do not really like each other. Both of them have the same personality, for example they both think that they are correct all of the time. This is not normally a good thing to have two people with the same personality living together; they do not normally get along. This is shown between Laurence and Beverley. Beverley likes to have control over Laurence, this get clearer throughout the play. "Laurence, would you put a record on for us?" Beverley is always asking Laurence to so something, for example when Beverley asks Laurence to get all the guest a drink. ...read more. During this scene Beverley again makes Laurence feel very small. She does this by being very sarcastic when she says her lines. "Oh, I'm sorry, Laurence, its just I cant hear through two brick walls." Beverley is saying these lines very dramatically and her hand gestures are big, this is due to her having too much to drink. "Laurence, would you turn the record up", this again shows how she controls him, this time even more so because at this point she is at the bar which is directly next to the record player. Laurence does not want to because he is trying to talk to the other guest. This is what he says but he really doesn't like the music that she is trying to play. This section also shows the contrast in tastes in music; neither of them likes the others music. They continue to argue about it and throughout the tension is getting more intense until Laurence grabs here arm. ...read more. He mostly sat on the sofa or just behind it getting drinks, this was in centre stage. He ventures into the kitchen sometimes to get some beer or to make himself a sandwich, this shows that once he comes back from work he just wants to relax but he can't because of his nagging wife. Beverley's costume shows that she is a woman who likes to show of herself and her money off. Laurence is wearing a work suite; this shows that he does a lot of work. Both costumes are very ugly, but that is because of the 1970's setting. The tension built up between Laurence and Beverley slowly and gradually throughout the play, this lead to Laurence's to death through worrying too much about his marriage. 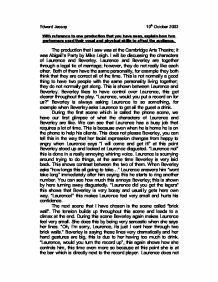 Throughout the play Laurence became a lot more agitated, this was mainly to do with Beverley and also Tony to some extent. Beverly became a lot more attracted to Tony as the performance went on thus increasing Laurence's anger. Beverly stayed about the same throughout the play; this was a very annoying character. ...read more. This was used when a newly wed was so depressed at the way live was going she killed herself and lay on the grass in front of her house wearing nothing but crockery. The sound effect made the scene that little bit more real and sent shivers running up and down my spine. Love is 'at arm's length' for them. His moves are shifty, quick and uneasy. He made us feel like we want to love him, and want to reassure him. We could put ourselves into his shoes, as we have all felt lonely at some point in our life. In a Student's Union building, 12 pool players were observed. After observation, 6 were identified to being skilled or above average players, and the other 6 were identified to being unskilled or below average players. The players were then observed by 4 other people situated around the pool table, and observed the players over a number of games. He relies on his wife, Kate, not to betray his guilt. The reason that he let the defective parts go was so that he could leave an inheritance for Chris. This shows how much he loves his family, he is willing to lie and let the punishment fall on someone else. setting our piece and when thinking about how to play and portray my character as Jack Murray I automatically thought of Bugsy. He influenced me by the way he acted as the character of Bugsy seemed to always be up to something behind your back and you never quite knew if he was coming or going type of character. The main challenge in rehearsal was harmonising, we resolved the problem by listening to the note each of us sang carefully to hear what note to sing to. Once we had resolved the problems met in the improvisation period and each member knew what they were doing we were able to rehearse seriously for the integrated piece. However this falters in Act 2 Scene 1, where a group of the convicts were imprisoned for stealing food from the stores and attempting to run away.